You are welcome to link to this data, but please do not post it anywhere. We will make numerous improvements and we want the most up to date information available to our customers. The developer package is now available! Click here to download it. The developer package includes a schematic, circuit board artwork, and source code for a functioning dual sensor setup. a more accurate meaning for the variable. and negative going pulses for the RPM input. Fixed problem with ground trace on PCB. Previous versions must add a wire from GND to ground terminal on the push button switch. It was not possible for the switch to function without this trace. This problem was caused by clearing of solder pour around J1, done to prevent possible shorting. Fixed DDRC issue with source code. 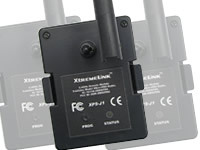 The XtremeLink� telemetry system interface consists of power, ground, and a 1-wire high speed serial bus. Power is provided by the receiver's servo bus and can be anything from 3.5v to 30v. It is highly recommended that your sensor electronics be powered with 3.3v by using an ultra-low dropout regulator. This will yield the best results and least amount of cost. The communication protocol is standard serial (8-N-1) at 125000 baud. 125000 baud is 8us per bit. Each byte of data requires 80us of time. Inherent delays between bytes are normal, and should not exceed 20us between bytes being sent/received. These delays are generally necessary for the call/return of the transfer routine as well as loading/saving the data. The serial interface is open collector. There is a 10K pull-up resistor on the receiver's telemetry port. This port line is pulled up to 3.3v by this resistor. Sensors MUST only drive the line LOW during communications. You can NEVER pull the line HIGH. The only exception would be when using another serial interface port that is also 3.3v compatible (such as a PIC16F688's serial port when powered at 3.3v). Sensors can NEVER communicate with the receiver unless they are told to. All devices must remain off the bus until called upon. Cable length for the sensors should be kept as short as necessary. We have tested multiple sensors through 30 feet of cable with no issues, but RF and other noise can enter through excessive wire lengths, so some care must be taken. Sensors are assigned ID's during the learning process. When the learning mode is entered, the receiver issues the command "InitMode" to all devices on the bus. At this point, all devices should turn on their status LED and enter learning mode. When the button on a sensor is pressed, the sensor will send the command "Request Device ID" to the receiver. This command asks the receiver to assign the sensor an ID number. The receiver then responds with an ID number that the sensor will store and use during normal operation. Sensors with multiple functions will need to send the "Request Device ID" command for each function. For example, if your sensor package contained a RPM sensor and a temperature sensor (like our example), then you would send the "Request Device ID" command, wait for the response, and repeat for the 2nd sensor. There is no need to use multiple button pushes. The receiver will only wait 1ms for a sensor to respond to any data request, so it is important that you handle the communications efficiently as possible. We recommend that the communications be interrupt driven to insure a speedy response. Our example sensor uses a polled configuration to show that it can be done this way, it is just not as efficient. Since 125000 is a non-standard baud rate for most PC's, you probably will not be able to use the COM port for debugging sensors. The easiest method for testing sensors is by using a USB<>serial cable. We recommend using the TTL-232R-3V3 from FTDI. Click here for details. This device allows you to set virtually any baud rate and uses 3.3v lines. You will need to use a diode to bridge the Tx and Rx lines together in order to have the proper 1-wire interface. The anode of the diode connects to the yellow wire and the cathode connects to the orange wire. The orange wire is the serial I/O line. Once you have the proper serial connection, you can send commands and receive data via a terminal program. We use MaxStream's XCTU software available here. It has the ability to create packets, display hex and ASCII data, etc. Note: The XDP.EXE program now has a developer tool in the TELEMETRY advanced option! You can send/receive packets and test sensors without having to use the cable as described above! Packets are made up of at least 4 bytes of data, but could contain many bytes depending on the command itself. Input commands will always have bit 7 set (0x80, 0x81, 0x92, etc.). Output commands will always have bit 7 clear (0x40, 0x41, 0x52, etc.). Command is the command being received or sent. In this case, it is the input command "InitMode". Device ID is the sensor ID. In this example, it is set to 0xFF which means "broadcast packet". A broadcast packet is one that is responded to by ALL sensors. Normally, the Device ID acts as a filter for the incoming commands. Only commands with the sensor's Device ID can be responded to. Length is the length of the data. In this case, there is no data so the length is zero. Some commands will pass information and the data length is required. Data is the data that being sent or received, if there is any. In this example, there is no data, so the Data Length is 0 and no Data is present. The maximum length allowed is 77 bytes. during the initialization mode (0x80). The Class defines the type of sensor. See Class list below. Sensor data sent by request (0x82). The sensor's vendor information sent by request (0x83). The sensor's output type and data format information sent by request (0x84). communicating. 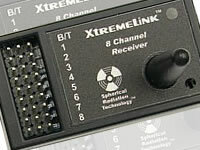 A broadcast Device ID is used. requests per second for the sensor is also given. This packet requests the sensor's data to be sent. This packet requests the sensor's vendor ID string information. This packet requests the sensor's output type and output format information.